‘Holding up a bottle full of rich red soil from Malawi which he collected while on a visit there several years ago, he reflected on the link between the dry soil and the flooded land,’ Andrew said. ‘As I watched the reports coming over last week of the huge devastation and destruction by Cyclone Idai in Southern Africa, one poignant image stood out for me. ‘It was a group of stranded defenceless people (men, women and children) cowering for safety on top of a bus, as a South African helicopter hovered to rescue them, in a new wilderness of a newly created lake that had previously being a road and a countryside of red rich soil now covered by water. 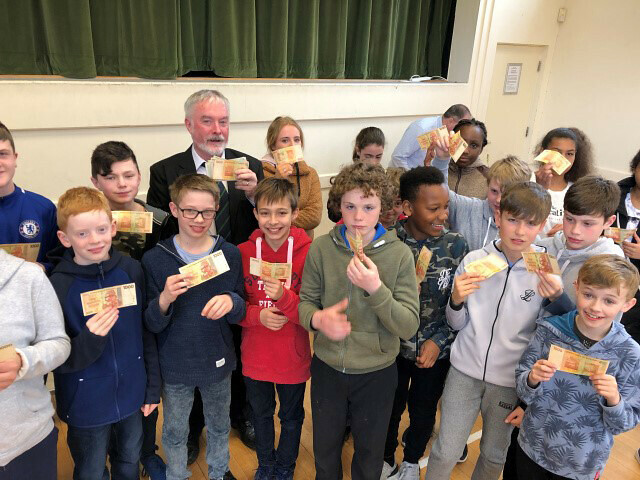 At the lunch Andrew Coleman, as a gesture of his appreciation gave each of the eighteen young people in the Confirmation Group a thousand–dollar bill. However, he also showed them a million, billion and trillion–dollar bills, all from the Reserve Bank of Zimbabwe. He went on to explain that due to hyperinflation in that country in recent years, their currency became worthless and so millions of dollars were required just to buy a loaf of bread. Andrew reminded them that while some disasters are natural and just happen, others are man–made and still bring suffering to many people. Hopefully, as the candidates look forward to their confirmation after Easter, their thousand–dollar bill will remind them of the fact that as Christians, we are all called to respond positively to human need where ever it occurs.